San Franciscans regularly ask how they can help and who they should call when they are concerned about a person experiencing homelessness or an encampment in the community. There are some circumstances where it is most appropriate to call 9-1-1, the Police Non-Emergency Number, or 3-1-1. Below are some common reasons why someone may call for assistance and who they should call. City departments are working to connect people living in encampments with services and shelters and to address the health and safety impacts of encampments. Please report encampments through the SF311 app, www.sf311.org site, or by calling 3-1-1. Your service requests to 311 provide important information that the City uses to track encampment activity and assign resources. Public Works will send out a “hot spots” crew to clean the area around encampments and mitigate the most serious sanitation problems within three days (though they strive to do so sooner than that). They will then “close out” the request and refer the issue to one or more other departments when appropriate. Department of Public Health Inspectors and the Fire Marshal are working to assess and address potential health and safety hazards citywide. The Police Department, with its newly dedicated homeless outreach team, is working directly with the police captain of each district to assess and address safety issues. The Department of Homelessness and Supportive Housing’s Homeless Outreach Team (SFHOT) is proactively working with the people in encampments to help them get appropriate services and into a shelter. Although you may see your request marked as “Closed”, please be assured this does not mean that your request was ignored. At times, requests are closed because the issue has been previously reported and the departments are already aware of the issue. In some circumstances, requests may be closed out by the original agency after they refer the issue to another department; however, that does not mean that the City agency to which the issue has been referred has also closed it out or is not taking action in follow up. 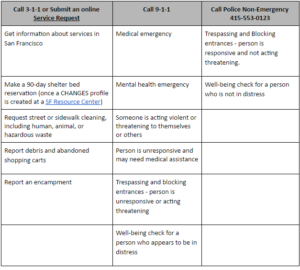 311 also provides regular encampment reports to the Department of Homelessness and Supportive Housing, the Police Department, the Health Department and San Francisco Public Works, so that they can identify “hot spots” and collaboratively create strategies for resolving encampments. Unfortunately, there are not enough shelters and navigation centers in the City for everyone who is homeless. The Mayor, the Board of Supervisors, and HSH are also working hard on finding shelter and housing opportunities for people living on the streets.